State court marshals are urging support for a measure that would empower them to carry firearms in state courthouses, but the bill faces an uncertain future as the legislature’s Judiciary Committee nears its deadline. Joe Gaetano, president of the marshals’ union, Local 731 of the International Brotherhood of Police Officers. But the Judicial Branch testified that its current system is capable of safeguarding the courts. 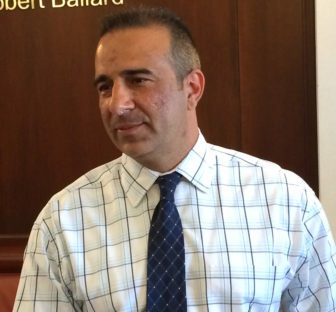 Gaetano, whose union represents the nearly 630 marshals who provide security at more than 40 state courthouses, said firearms weren’t always banned from these facilities. Before 2000, when courthouse security was provided under the former county sheriff system, special deputy sheriffs were authorized to carry firearms. The union believes that armed marshals are not needed in all locations within courthouses. Armed individuals should not be in courtrooms or in the prisoner lock-up area, he said, but only in key strategic locations. 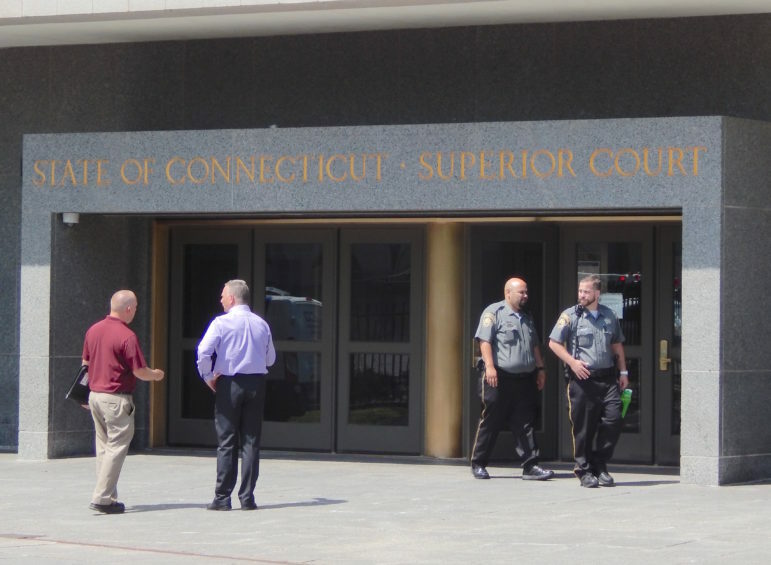 Armed police guard the Capitol and Legislative Office Building as well as the offices of the Connecticut Supreme Court, Gaetano noted. The high court shares a building with the Connecticut State Library and Museum, and security there was established by an Executive Branch order. Gaetano said three-quarters of his members are former military personnel and most already have valid state permits to carry firearms on their personal time. Two marshals also have been certified as firearms instructors, he said. Judge Patrick L. Carroll III, right, chief court administrator. At left is Tom Siconolfi, executive director of administrative services for the Judicial Branch. The two sides do see eye-to-eye on one element of court security: the need for more court marshals. “Budget cuts to the Judicial Branch have decimated our marshal ranks,” Carroll testified, adding that the courts have 100 fewer marshals than they did one year ago, and have 190 vacant posts they would prefer to fill. “ … If the legislature is interested in helping the Judicial Branch bolster security, the single most effective measure that can be taken is to provide adequate funding to fill those vacancies,” Carroll said. Court leaders laid off 101 marshals last June as part of a larger cost-cutting effort after facing more than $77 million in reductions ordered by Gov. Dannel P. Malloy and the General Assembly. Friction intensified a few days after the layoffs when the branch hired armed state police troopers — at overtime pay — to enhance security for two weeks outside of courthouses in Bridgeport, Hartford, New Haven and Waterbury. Branch officials insisted the added security wasn’t linked to the layoffs and had been preceded by gang activity outside of the Bridgeport courthouse. The union countered there was no evidence of gang activity at the other three locations and filed a complaint with the state Board of Labor Relations. The union dropped the complaint in early July after the branch ceased using the troopers. 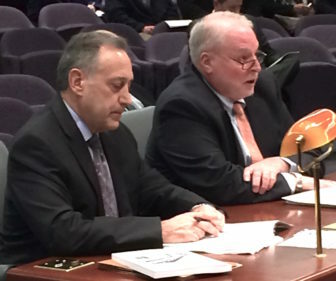 Two of the Judiciary Committee’s chairmen, Rep. William Tong, D-Stamford, and Sen. John Kissel, R-Enfield, both were cautious when asked about the likelihood of the measure’s being adopted before the panel’s Friday deadline. “It’s certainly not dead, but it is controversial,” Kissel said, adding that Judicial Branch officials “have raised a lot of legitimate concerns. The Judiciary Committee’s deadline for acting on its bills is 5 p.m. Friday. Two judicial marshals outside Superior Court in Hartford.